We live in a very interesting age for video games. 20 years ago the market was still growing; AAAs weren't quite so monolithic and the the market didn't have the accessibility or the infrastructure for indies to thrive. Yet in a world where game budgets are getting outrageously out of hand, the indie market is flourishing. In a world where Activision and Ubisoft and Gamefreak are pushing yearly releases of big franchises, we have a plethora of indie games. Games which can be successful thanks to digital distribution, word of mouth. Games which, without hundreds of millions of dollars riding on them, can get away with taking creative risks. 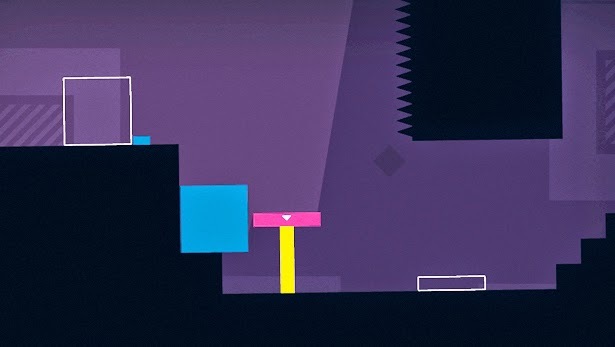 It is in this world that a game like Thomas Was Alone, a game about colored rectangles, can sell over a million copies. Myself being among them, I thought I would talk about what makes such a simple game so great. 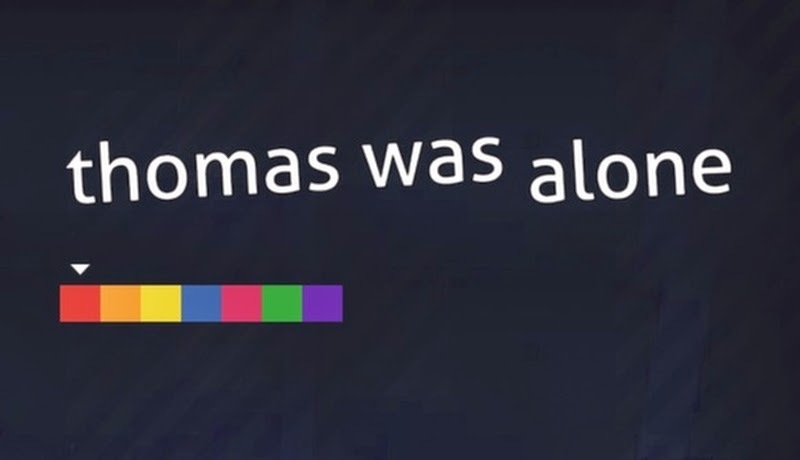 So aside from rectangles, what exactly is Thomas Was Alone about? Well the idea is to reduce a puzzle platformer to it's most basic elements. Image a game like Trine or The Lost Vikings, wherein you control a group of characters one at a time. Each character has a personality and a backstory and a set of abilities, and you must combine these abilities in order to get the entire crew to the end of a level. All of these things are also true of Thomas Was Alone, except instead of Eric the Red and Baelog the Brave, you have Thomas the red rectangle and Claire the blue square. While they don't have fancy graphics or flashy abilities, I would argue that the characters in Thomas Was Alone are much better defined than most games without ever saying a word, and the game's narrative is shaped significantly better than most, too. When you first start the game, Thomas is quite literally alone. You are given several levels to get the hang of what Thomas can do by letting the play figure it out (as is the case with every new character you are introduced to). While you are learning, the fantastic British narrator introduces you to the story of Thomas, who is lost, confused and lonely. Over the course of the journey you are introduced to other rectangles, such as Chris the pessimistic orange rectangle and John the narcissistic yellow rectangle. Each level the narrator tells you a little about the characters, sometimes a little about the story, which in truth, is barely there and really kind of irrelevant. The story is about the characters and their journey more so than the game's actual plot. Sure there are puzzles. They are well made, they are well paced, they make you think without being too hard, everything a puzzle game should be really. Yet to me, what really sets Thomas Was Alone apart is the unspoken narrative. I think Chris really tells the tale of Thomas Was Alone. When you meet him, he is down, antisocial, and not much use to be frank. He's small, he can't jump very well, and he constantly needs the other characters' help to get around. But sometimes there's a spot that only Chris can reach, you need his help to progress. The same is true of every character. Some characters are more capable on their own, but at some point they all need help, and no matter how pathetic a character may be solo, there always comes a time when you need their help. Nobody can make it on their own, and when they work together not only can you make it to the next level, but your little rectangles grow as people(polygons? ), too. Their personalities perfectly match their abilities, and each character has real and measurable character growth. I often found myself identifying with the little shapes, sharing in their woes, and celebrating their accomplishments. It's truly astounding how such a minimalist game can send such a powerful message, and it's all because the narrative and the gameplay are as one. Sure, the narrator is great and lines are well written, but the strongest messages are the ones that are inferred rather than stated. Of course, you can have all of these things and have a game that isn't actually much fun. Often this is the case with the most "artsy" games. I don't believe this to be the case with Thomas Was Alone, however. None of what I mentioned is thrown in your face if you aren't looking for it. 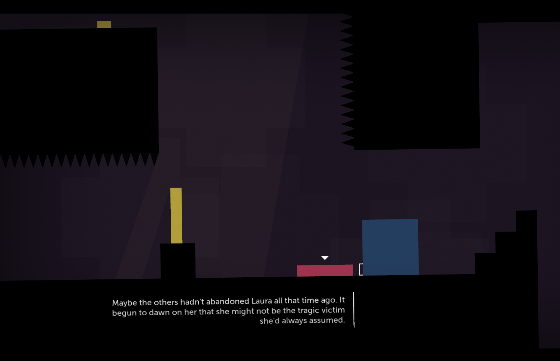 If you are just looking for a puzzle platformer, Thomas Was Alone does that, too. You don't have any grappling hooks or rocket boots or arcane magics, but figuring out how to use each character's size and abilities does make for quite an interesting game. It's not very hard nor exceptionally long, but it will make you think in a way that no other game will. It's also very good for short sessions, with most levels being easily beaten within 15 minutes. All in all, I would say that if you are looking for a good puzzle platformer, an interesting game, a strong narrative or any combination therein, Thomas Was Alone is definitely worth your time.